The extended winter market offers seeds and plants, too. It hardly seems right to call it the Power Road Winter Farmers Market, since spring is well underway. The month-long extension of this popular market, held at Positive Attitude Dance Academy in Farmington, will smooth the transition to the Farmington Farmers & Artisans Market, which will open May 7 at the Walter E. Sundquist Farmington Pavilion and Riley Park in downtown Farmington. The last Power Road Market will be held April 30. Power Road Market Master Jean Smith said this Saturday's event will be a gardening extravaganza, with "lots of plants and seeds for sale. Garden Gate will have seed potatoes, onion set and a full line of organic and non-organic seeds." Look for hand-crafted pine children's picnic tables, she added. 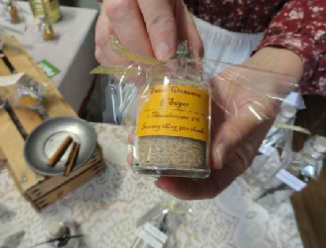 Lapeer-based James Creek Sutlery, which offers organic spices, artisan salts and flavored sugars, plans a clearance sale to make room for their new summer labels, Smith said. Discounts will be deep on their sweet cinnamon or sweet cinnamon and sugar, made with Ceylon cinnamon; white, red, green, black and smoked organic pepper; and popular meat rubs. Among the 17 or 18 vendors expected at the Market, Relic Soap, a Farmington-based business, will offer new varieties of hand-crafted soaps, Smith said. The popular "kettle corn ladies" will returns, as will Elderberry Heaven, which offers organic elderberry syrup, believed to help with colds and allergies. The market is open from 9 a.m. to 2 p.m. Admission is free.